For several years, Fun Planners has helped to shape many team building programs that not only promote an organizations or foundations goal, but to also excite all employees and members involved. As the Orlando weather starts to tone down, now is the time to be thinking about Orlando team building exercises for your company or organization. Fun Planners has created a list of the top 5 Team Building Exercises that help get your team on track this fall. Poker Tower – Distribute your employees into groups of 2-5 and distribute a pack of poker cards and one pair of scissors to each group. Each group will have to build the tallest tower using only the cards and scissors. This activity promotes: Team Work, Communication, Friendly Competition, Creativity. Time: 15-30 min. Silly Olympics – Create an array of events with Silly Olympics that include giant tricycles, over sized puzzles, big foot relay, and much more. This activity promotes: Team Work, Communication, Competition, Physical Activity. Time: Varies based on each Olympic event. Talking in Circles – Place a long string or rope in a circle and have your team stand around the circle. Make sure it is big enough for each member in your group to grab a hold of. Instruct each member to grab a piece of the rope with both hands and hold it waist high. Without letting go of the rope, instruct the team to form shapes such as triangles, rectangles, etc. Once you have successfully done that, do the activity with their eyes closed. Human Knot – A popular activity with many organizations. Here, your group stand in a circle, shoulder-to-shoulder. Each member takes their right hand and grabs the hand of someone standing across from them, not next to them. Then the members take their left hand and grab the hand of any other person. The team must untangle themselves without breaking the chain. Physical Challenges – It’s important to know the physical limitations of your members before deciding to do any physical challenges so that you don’t alienate any team members. If everyone is on board, you can have great physical challenges for team building events such as: Obstacle Courses, Rock Climbing, Relay Races, and much more. If you work with an Orlando team building company, they can build you a “course” of physical challenges that will suit your needs. This activity promotes: Heavy Physical Activity, Communication Time: Varies based on each activity. 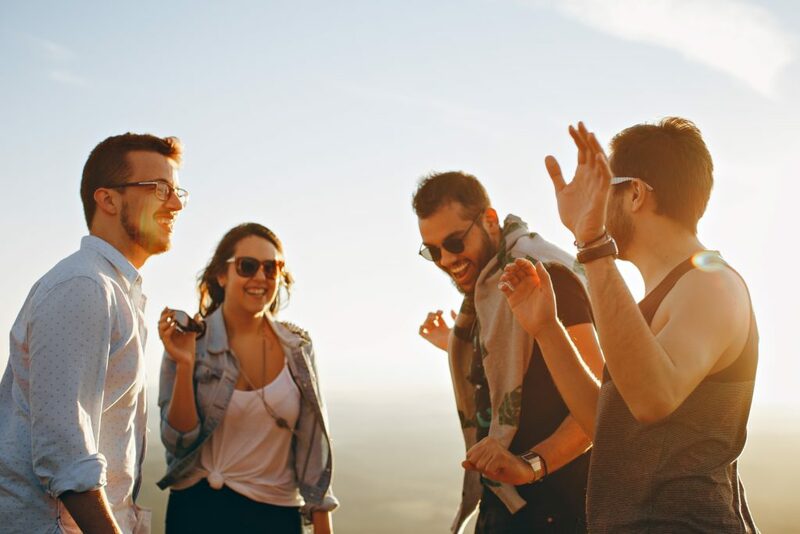 There are a wide variety of options for team building events in Florida, and Fun Planners can help you determine the best team-building exercise for your needs. To learn more about our Orlando team building, contact us at 1-866-511-4FUN. In the corporate world, the term “overcoming obstacles” is more than just a metaphor for solving a tough problem. Obstacles are both mentally and physically exhausting, but once the goal has been met, it’s a liberating and gleeful experience. As a team, you work together, establish goals, and do everything within your power to excel and squash the competition. For your next team building event, give your employees an obstacle like no other–let them conquer mountains and race down slides with Fun Planner’s expansive selection of inflatable rental obstacle courses. An obstacle course is a great way to let your team work together to accomplish something that may seem impossible. When presented with an obstacle course, your team will stare at this looming challenge, unsure whether they can accomplish their goal. Once they have, they’ll look back and be presented with a visual reminder of their achievement and feel immense satisfaction and unity. To ensure that your team building event doesn’t result in an unexpected trip to the emergency room, make sure your team recognizes and knows their limits, drinks plenty of water, and practices safety while tackling the course. Allow your team to preview the course and discuss how best to accomplish their goal. This will also give some the opportunity to assess which hurdles they are unable to accomplish due to injury. If they are unable to get on the course because of a disability or chronic injury, allow them to help coach others through the course on the sidelines. Better yet, let the entire team help coach the person currently on the course–make it a timed event and break your team into smaller groups of 3 or 4 and let them battle for a free lunch or day off. Treat each inflatable hurdle as a life- or work-related obstacle. A team building challenge will help your team work together; recognize weaknesses and strengths in one another, allowing them to solve problems and strategize; and celebrate personal and group achievements. Always remember to stretch appropriately before the event. You can lead a large team stretch or allow each team to lead their own stretches. If you choose the latter, consider handing out a form that lists and demonstrates all the appropriate stretches so everyone is properly warmed up and prepared for the event. If you’re looking for a reliable company to provide your team with the necessary tools for your next team building event, contact the professionals at Fun Planners today. Has your team ever faced and tackled an obstacle course? Share your experiences with us! Living in the beautiful sunshine state gives us the opportunity to host all of our Orlando team building activities outdoors, however, with Florida weather’s fickle nature, not all events go according to plan. If your team building event is interrupted by severe weather this summer, your first priority is protecting your guests and the event’s staff. Here are 6 event tips to help prepare your organization for unexpected dangerous weather. Have a contingency plan. Planning for uncooperative weather should begin months before the actual team building event. Have a backup plan as to what you can achieve in case the event does get pushed indoors. Also, have a disaster plan drawn out that contains local law enforcement’s, security’s, medical professionals’, and your PR staff’s contact information in the event of an emergency. Monitor the forecasts. Monitor the weather for a few weeks prior to the event and see how consistent weather fluctuations are. Use the National Weather Service forecast, the Storm Prediction Center, and the National Hurricane Center for accurate weather information. You could also invest in a private forecaster for the event, they’ll pinpoint your exact location and consider the weathers influence on newby bodies of water or other landmarks. Also, consider looking at the previous year’s weather forecast for the day of your team building activity. Have a designated decision maker. Outside of emergency services, have your decision maker decided so if/when a weather emergency occurs, the designated decision maker can take control of your Orlando team building event. Having this position predetermined is essential. Your evacuation or other plans will work better if the attendees are not all standing around, arguing about who should be in charge. Consider weather when selecting a venue. If you want to host an outdoor event, by all means, you should. However, keep weather in mind and make sure there is a nearby shelter in case of a weather emergency. If not a nearby shelter, at least consider how closely cars can be parked to the event so you can pack everything and everyone up quickly. Provide shade. Not all severe weather involves rain. Severe heat is a major concern in Florida. Have covered areas where your team can cool down. Make sure that your event is equipped to deal with heat by stocking it with hats, sunscreen, and plenty of water. Secure all mobile structures and tents. If you’re dealing with high winds, you’re going to want to bolt down any temporary structures, such as tents and inflatable objects. During your event, safety is of the utmost importance. For your next Orlando team building activity, consult the experts at Fun Planners. We’ll help you plan and set up the perfect team building event that is not only safe, but memorable as well. Share this post to help educate your organization’s management of the importance of proper weather planning. Orlando team building has been called an art and a science–but technically it’s both. A team’s quality of work is a direct result of the quality of the team. To keep your team on track and working together in a unified and cohesive manner, don’t skimp on the team building activities. Don’t roll your eyes–when team building activities aren’t awkward scenarios, where your team ends up hating each other and wishing it would all end, they can actually work. When you properly plan a team building event, the results can have a measurable, positive effect on your teams work performance. The key to an noninvasive, unawkward Orlando team building experience is to keep everything normal. Don’t have your team gather around and talk about their most embarrassing moment or their greatest fear, as some people don’t appreciate that. Remember, every member of your team is unique. Some of your team members will be introverts, other extroverts, and that’s a GOOD thing. Don’t push your introverts to be more extroverted, or you’ll only alienate and embarrass them. In a study done by Citrix, 31 percent of office workers said that they cannot stand team building activities. This is disappointing to say the least, especially since a study done by the American Psychological Association (APA) found that team building can help employees feel valued, making them feel more motivated to complete their job at an above average level. An area that most organizations don’t really consider when predicting their team’s success is the interpersonal communication that occurs during informal meetings. Studies have determined that communication is actually the most accurate predictor of a team’s overall success. Your team doesn’t have to be best friends and hang out outside of work, but non-work communication is a critical component when analyzing a team’s cohesiveness. It’s important that your coworkers don’t just see each other as coworkers, but as peers and maybe even friends. With a nicely planned, non-aggressive team building activity, your team can communicate and interact more efficiently, increasing their productivity, build respect for one another, and raise their job satisfaction. Help your team function as a universal unit with Orlando team building activities hosted by Fun Planners. We guarantee that your team will thoroughly enjoy the team building activities we offer–even the somewhat shy and quiet introverts. Who knows, it may even bring them out of their shell and allow the rest of the group to get to know them. Share this post and follow us on Facebook to learn more about team building and how we can help you create lasting relationships among your team members and management. A great leader is the hallmark of every great team. A team leader makes difficult decisions for the betterment of the group, makes course corrections and devises a standard for performance for the rest of the group. Because of all these factors, a team leader is an integral part of the Orlando team building process. When team building, you work as a group to reach a common goal, but each team needs a leader to help, not dictate, the team’s operation. Evaluate your leadership style. You need to be able to critique yourself and recognize your strengths and weaknesses. Treat your team fairly and remember, you’re accountable for the team building activities success. Know your team. You should know your team’s dynamic, as well as each individual’s strengths and weaknesses. If you’re the one who was nominated, or who requested the Orlando team building leadership role, you need to know your team. Define clear roles and responsibilities. During a team building, and work related, activity, each individual’s responsibilities are interconnected and dependent on one another. Communicate your strategy and make sure your team know’s what they’re suppose to be doing. Be proactive and give insightful feedback. Don’t scream at your team members if they’re doing something wrong. Feedback should be given constantly and it should not be a reaction to a problem. It’s also important to remember that not all feedback is about corrections, tell your team how well they’re doing during the activity. People love to be recognized for good deeds, and they’ll appreciate the respect. Celebrate your success. ALWAYS celebrate your team’s success. Having a short cheering fit after you’ve completed a team building activity is not enough. Make sure that your team understands how successful they are, how much you appreciate them and how their success has positively impacted others. This advice is not only applicable for team building leaders, it also applies to managers and company leaders. But a great leader knows that their success is due to their team. Whether you’re the CEO, running a multibillion dollar company, or just the guy who volunteered to lead your small team during your company’s annual team building picnic, knowing how to effectively run your team will result in current and future success. If you’re looking for help on your next Orlando team building, contact the team building experts at Fun Planners today. As Americans, we spend the majority of our time at work. As such, this creates an unusual situation when we’re surrounded by people we don’t enjoy being around. Not only is your employees satisfaction and happiness at stake, but your company may be at risk as well. It’s no secret that work productivity is directly linked to employees personal connection with coworkers. A recent study completed by Unify, a communications software company, has established and quantified the attributes of a successful team. All of these attributes can be enhanced through Orlando team building. Friendly competition during team building exercises stimulates friendly conversation and deep bonding that could help focus your employees. Having regular team building activities will make your employees comfortable with one another, increasing the likelihood of them speaking up during meetings, and pitching new ideas without fear of rejection. Listed below are the hallmarks and attributes of a successful team, that regular Orlando team building will help to enhance within the workforce. Personability. Nearly 71% of people involved in effective teams have personal conversations, unrelated to work, on a daily or weekly basis. In a less proficient team, only 38% of employees converse with their coworkers on a personal level. Team building will increase your coworker’s personability and comfort with one another. Candid. Being candid, or truthful is another attribute of a successful team. About 84% of successful teams are likely to voice disagreements. Regular team building will help your team vocalize more within their personal and work lives. Collaboration. 77% of teams who are noticeably successful report that less than a quarter of their meetings are filled with one-way monologues. Team building activities are about collaboration. This allow your team to practice and enhance this skill in a unique and fun way. Increase the frequency in which you organize team building activities and your team will start displaying the hallmarks of a successful team. For assistance in your next Orlando team building effort, contact the dedicated event specialists at Fun Planners. We will help you plan an amazing team building activity for your employees that will be fun and beneficial to your organization. Team building offers a great opportunity for individuals to learn the essentials of working as a team, but when it comes down to it, many people dread workplace team building events simply because they are not well thought out. It’s important to customize your event to not only fit the needs and goals of the company, but also of the individuals themselves. When considering any team building activity, you want keep in mind a few factors to best fit your achievements and to cater to your employees. 1. Not everyone on the team will have the same physical abilities as the next person, which is something to consider when choosing an event. Some members may have limited mobility, and it’s important to realize that you should consider the individual before you choosing a team activity. It may be best to know how everyone deals with physical tasks on an individual basis. 2. Charitable programs give companies the opportunity to give back while engaging in a team building event. If your group is interested in giving back, charities and fundraisers can be considered as a team builder; if this isn’t necessarily your goal, you can focus on other responsibilities and goals you wish to accomplish, such as activities that act on communication and trust. 3. Selecting an activity is largely based on the space you have to host the event. Is it outdoors with a lot of available space? Perhaps you have an indoor area suitable for a fundraiser or casino event. Before choosing an activity, knowing the location of your team building event is essential! 4. How long is your event going to be? What does the schedule look like for the day? Have a good sense of the day’s schedule when choosing activities; If you only have a few hours to engage in a team building activity, you need to know which activities will fit into that set amount of time. This also gives you the opportunity for a little time management training! Orlando team building events are a great way to bring out positive characteristics in the workplace and increase contribution to the objective of the company. Fun Planners can help you plan a successful team building event to increase productivity and group morale. Call us at 1-866-511-4FUN to learn more about our services and to receive a quote for your next corporate event or party.